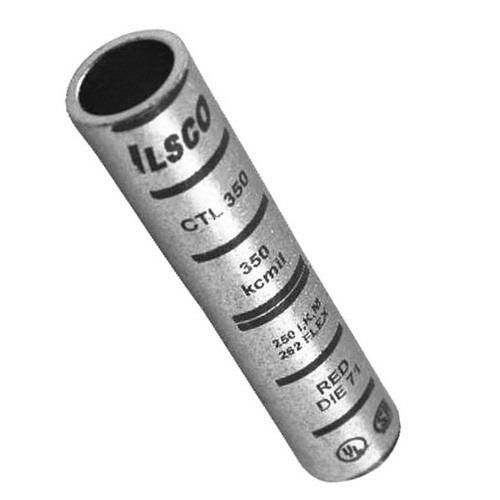 Ilsco CTL Compression sleeve in black color, is suitable for grounding and bonding applications. Sleeve features copper construction with electro-tin-plated finish to offer superior protection against corrosion. This high-strength seamless copper tubing construction renders superior conductivity along with enhanced crimping characteristics. It accommodates conductor of size 700-KCMIL and the chamfered entry provides easy conductor insertion. It measures 5.8750-Inch x 1.031-Inch ID x 1.3130-Inch OD. Sleeve has voltage rating of 35-Kilo-Volts and withstands temperature of 90 deg C. Compression sleeve is UL listed, CSA certified and RoHS compliant.